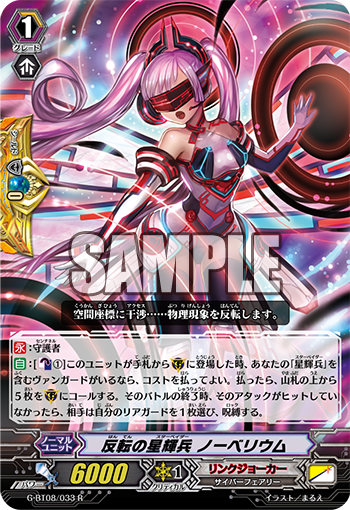 AUTO: [CB1] When this unit is placed on (GC) from hand, if you have a vanguard with “Star-vader” in its card name, you may pay the cost. If you do, call 5 cards from the top of your deck to G. At the end of that battle, if that attack did not hit, your opponent chooses 1 of their rear-guards, and locks it. Today we’re introducing a powerful Quintet Wall Unit from “Absolute Judgement” (on sale August 26th, 2016)! It’s “Inversion Star-vader, Nobelium” who can be used in a “Star-vader” Deck! When it’s placed as a Guardian, if your Vanguard is a “Star-vader”, you can Call the top 5 cards of your Deck as Guardians! And if your opponent’s attack fails to hit, they’ll be forced to Lock one of their Rearguards. If you stop the attack of your opponent’s attacking Vanguard, you can chip away at your opponent’s offensive Rearguard capabilities. If it’s a Grade 2~3 Unit’s strength, it’s possible to save cards in your hand to Guard later. If your Vanguard is “Star-vader, Chaos Breaker Dragon”, that effect is huge! You need a Locked Rearguard to use his Limit Break to draw, meaning you can make a huge split in the terms of strength between you and your opponent! There’s other “Star-vader” Units in “Absolute Judgement”. Decks centered around diabolic Cyber Dragons like “Chaos” or “Infinite” get even stronger! So pay attention to future information!